FunPlus Game is a mobile and social gaming company that provides interactive games for mobile devices and social networks. Friends and family can play FunPlus games on Facebook and country-specific social networks, including Hyves in The Netherlands and VZ Network in Germany. Customers can also download games from Amazon, Apple, or Google for play on mobile devices. FunPlus is a global company with offices in China, the United States, and Canada. More than 6 million active daily users across all channels play FunPlus games. When FunPlus started in 2010, the company was using a hosted solution with a traditional datacenter provider to develop its first game. FunPlus is a six-person team of developers who use code extensively in their environment. They wanted to focus on writing games, but the servers in the data center were not programmable, and it often took hours or even days to scale servers. The team began to look for a solution that would provide scalability, reliability, and programmatic control over their environment. The FunPlus development team used APIs to program a custom auto scaling process optimized for their game environment. This process can automatically scale to thousands of production servers during busy periods and scale down to hundreds of servers during low traffic. By using AWS, FunPlus can deploy a new server in less than one minute. “We use scripts for everything,” says Guan. 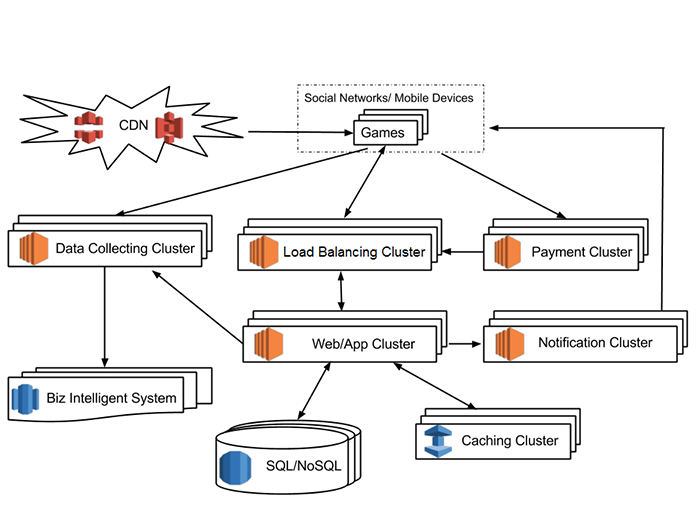 “Using AWS we were able to build a true auto scaling cloud infrastructure on top of Amazon Simple Storage Service (Amazon S3), Amazon Elastic Compute Cloud (Amazon EC2), and Amazon CloudFront.” Guan estimates that it now takes less than four hours for FunPlus to set up and deploy a new release. Figure 1 demonstrates FunPlus’ architecture. To manage costs, FunPlus takes advantage of Amazon EC2 Reserved Instances. “We’ve been using Amazon EC2 Reserved Instances for at least a year and overall, we lowered our service costs by 10 to 15 percent,” says Guan. To learn more about how AWS can help your gaming needs, visit our Gaming details page: http://aws.amazon.com/game-hosting/.